Yes, Multigroomer, is all that you need to create your perfect style that includes a full size trimmer, detail trimmer, mini shaver, hair, beard & stubble combs , gives you all the tools to perfect your look. Now, you can do it all by sitting just in your home; then why to spend thousand of bucks in hair salons. This amazing multigroomer from Philips is very simple to use. Quite versatile to use with around more than 18 settings for beard and & moustache comb, around 12 length setting for detail & stubble comb and around 18 length setting for hair-clipping comb.This is a full size trimmer for neck line, sideburns and chin with detail foil shaver for a close finish around the edges. This multigroom trimmer is very much skin friendly and will twig out even the facial hair with an ease. You will get a 21mm detail trimmer for fine lines, small areas and details areas and details. After 10 hours of continuous charging you can use this multigroomer for around 35 minutes. You can wash this multigroomer after use as it is fully waterproof. The travelling pouch, that you will get ll help you to carry this while travelling. You will also get 2 years manufacturer warranty from date of purchase. This multigroomer from WAHL is one of the best multi groomers available in market and why it ll not be? Rust-proof surgical stainless-steel blades are pretty easy to be cleaned and rinsed. Protective Cap of the multigroomer keeps the blade safe while travelling. You can easily clean your nose and ear hair with this trimmer. 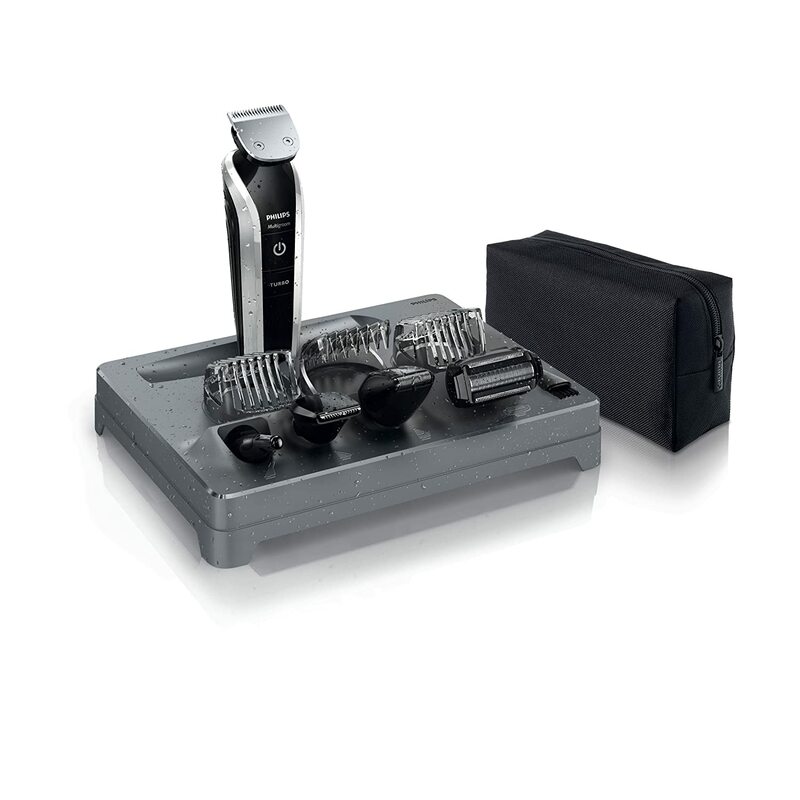 The best part is, it has 4-in-one for trimming (high grade blades to trim your facial hair), detailing (intricate designed trimmer to trim the nose, ear and brows), shaving (ultra close shave to trim the edges) and clipping (easily cut hair and outline). It operates on one AA battery. This WAHL lithium ion multi groomer is the world’s first grroming device with Lithium Ion Technology. It consumes energy only when it is used and runs almost 3 times longer than any average personal trimmer. It doesn’t loose any charge when not used unlike other trimmers whose average loss is around 18%per day. You will get 2 years manufacturer’s warranty from the date of purchase. This QG3343/16 Multi Purpose Trimmer from Philips is another wonderful product with 18 length setting setting beard and mustache comb, 12 length setting detail and stubble comb. You can use it for 35 minutes continuously after charging it for 10 hours. The skin friendly blades of the trimmer makes the trimming way more easy on those tough to reach areas like face and neck. Not only this trimmer but also you will also get a beard trimmer, beard and subtle comb detail trimmer, handheld styling comb, nose trimmer and cleaning brush. You will get a 3 year warranty period with this product. This Philips QG3383/16 Multi Purpose Groomer is the one to get the complete powered groom look. It comes with a complte kit of a metal trimmer and a set of 7 attachments including adjustabl combs with around 18 length settings. It runs on NIMH batteries. This is easy to use and maintain. It has a warranty period of 3 years. You can get fast results on thick hair with the turbo setting, which increases cutting speed. This Philips QG333/15 multi-purpose groomer is just perfect to get your new groomed style everyday at your home. This will give you precise trimming with professional look. This multigroomer is made up of chromium steel .It offers you precise cuts and lasts longer. The blades are self sharpening and are extra durable. The rounded blade tips minimize irritation on the skin. It is fully water resistant but still it shouldnot be used on wet hair. But it can be wshed everytime after it’s use. It runs with a rechargeable battery which has to be charged for around 10 hours to use it for 35 minutes effectively.Battery has to be charged only when it is nearly empty. It comes with a 2 year warranty period from the date of purchase of the product.